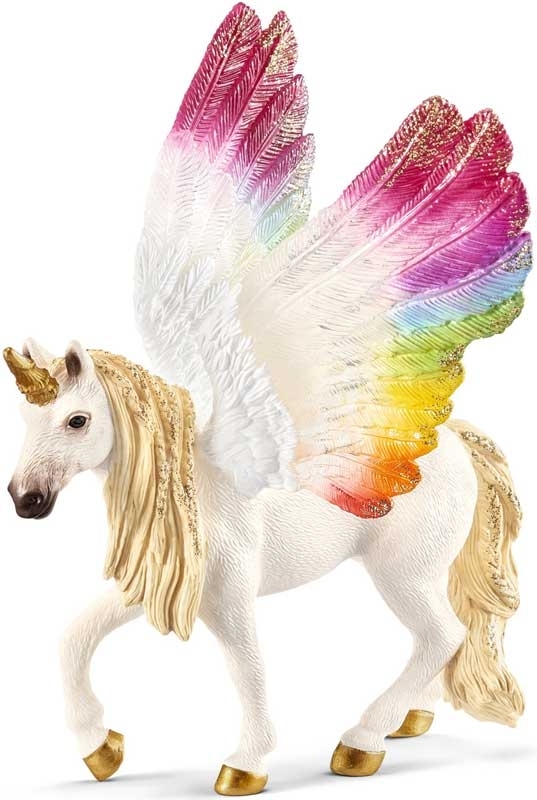 Hidden in the mountains of Rainbow Island, there lives a Pegasus unicorn with its little one. Their wings light up in all colours of the rainbow, even more magnificently than any of the other creatures of this colourful island. The winged rainbow unicorn has recently begun taking along its little one on its wings across the island to the end of the rainbow. The elves there know and love them. Whenever they see them, they clap and cheer for them, and they look forward to the day of the Rainbow Festival. Because then the two of them come to the elves and they celebrate together. It is the most beautiful and colourful festival in all of bayala. Guests come together from all corners to bid welcome to the two wondrous, flying creatures and to behold their beauty and majesty of colour.